A warm "Hafa Adai!" from Guam and the staff and management of Tamuning Plaza Hotel! Contact Us It is our pleasure to welcome you to Guam and Tamuning Plaza Hotel. Whether your visit to Guam is for business or leisure, we believe in providing you with the best quality accommodations at the best value! Our staff and management strive to provide friendly, informative, and efficient service for your comfort and convenience. We are so sure we can provide the better value, we offer you to find better rates for comparable accommodations! If you can find a better offer, please TELL US ABOUT IT, AND WE WILL MAKE OUR BEST ATTEMPTS TO BEAT OR MATCH THE OFFER! What have you got to lose? You find the best value for your travels to Guam, and we continue to provide you with the best rates and accommodations! Our most popular package had you in mind for this great Room and Car Deal! 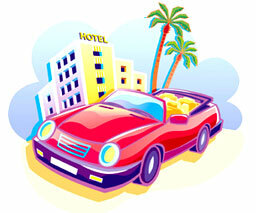 We currently have discounted car rental rates with Paradise Car Rental. Package rates start from only $89.95 per night, for our Single Room and an Economy Car! Show us your Guam Driver's License or other valid picture I.D. upon check-in, and ask about any special discounted local discounts!